Many U.S. law firms host blogs. They do so in part so that in-house counsel find them if they search for a topic on the internet or so that they develop followers of the blog who are interested in the issues dealt with by the blog. Law firm blogs, in short, are marketing. But how many law firm blogs are there? I researched the blogs of 65 U.S. law firms that have 200-300 lawyers. Those firms are Adams and Reese; Archer & Greiner; Armstrong Teasdale; Baker & Daniels; Balch & Bingham; Bingham Greenebaum Doll; Boies, Schiller & Flexner; Brownstein Hyatt Farber Schreck; Burr & Forman; Butler, Snow, O’Mara, Stevens and Cannada; Cahill Gordon & Reindel; Carlton Fields; Chapman and Cutler; Clark Hill; Cole, Scott & Kissane; Dickinson Wright; Epstein Becker & Green; Faegre Baker Daniels; Fenwick & West; Fisher & Phillips; Foley Hoag; Fredrikson & Byron; Gardere Wynne Sewell; Gibbons; GrayRobinson; Honigman Miller Schwartz and Cohn; Ice Miller; Kelley Drye & Warren; Knobbe Martens Olson & Bear; Lathrop & Gage; Leonard Street; Loeb & Loeb; Lowenstein Sandler; Maynard, Cooper & Gale, McElroy, Deutsch, Mulvaney & Carpenter; Miles & Stockbridge; Miller Canfield; Moore & Van Allen; Morgan & Morgan; Parker Poe Adams & Bernstein; Phelps Dunbar; Porter Wright Morris & Arthur; Quintairos, Prieto, Wood & Boyer; Robins, Kaplan, Miller & Ciresi; Robinson & Cole; Roetzel & Andress; Saul Ewing; Shumaker, Loop & Kendrick; Shutts & Bowen; Steptoe & Johnson PLLC; Stinson Morrison Hecker; Stites & Harbison; Stradley Ronon Stevens & Young; Strasburger & Price; Stroock & Stroock & Lavan; Taft, Stettinius & Hollister; Thompson & Knight; Vedder Price; Wachtell, Lipton, Rosen & Katz; Warner Norcross & Judd; White and Williams; Wiley Rein; Williams & Connolly; Williams Mullen; and Winstead. 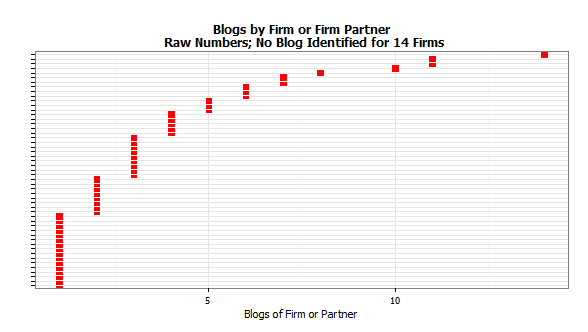 The plot below shows how many blogs I identified for each firm. In coming days I am going to write about various ways to analyze the blog data from this set of firms.